One time Winky gave me a box of marshmallows. What she handed me was about the size of a corsage box and heavy as a grapefruit. I looked at the label. I wondered about marshmallows that weighed so much. There must be a bunch of them in that box. 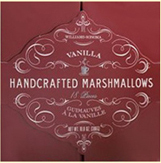 No chocolate or pecans, just pure marshmallows, except they might have had a chance encounter with peanut products. Williams-Sonoma’s ad agency certainly earned their paycheck. The box itself was a work of art. It told all about the marshmallows, how it took three days to make them. I imagined an apple-cheeked man with a tall white toque, stirring a shiny copper cauldron with a big wooden paddle. Sometimes when these fantasies erupt, it’s 1932. But I digress. First there was a heavy cellophane wrapper to peel off the box. Then there was a wide cardboard ribbon to slide off. The face of the box opened like shutters, and inside was another box. But not just any box. It was like a small safe. It had a little hiding place for the marshmallows, which were also wrapped in more cellophane, not once, but twice. I looked at the block of perfect marshmallow cubes, cut three-by-three like a nine-piece quilt square. There were two layers of them. I pulled out the first marshmallow that would let go of its family. It was like nothing I’d ever tasted. It was light yet substantial, and you could taste something besides sugar and air. This was a marshmallow you could depend on. As I chewed and chewed, I read the rest of the marshmallow story. It said you could heighten your marshmallow experience with a cup of cocoa or a pot of chocolate fondue. Was I supposed to wait for chocolate fondue? I couldn’t think of anyone who might have some handy, so I took mine straight. I would think about fondue another time. Standing at the kitchen sink in near-dark, in my nightie and houseshoes, I popped a second marshmallow. For just a minute, I thought about the unpaid bills I had on my desk, and the ones that I knew Winky also had on hers. I thought about other friends and family who lately were adding more beans and rice and noodles to their meals. Here I was, eating a marshmallow that cost over a dollar. Sometimes life is so wonderfully strange I have to write it down.